This concert featured Duke Ellington's Sacred Concert, a wonderful, vibrant, jazzy work that was very different from our typical repertoire, although WCS does like to stretch its comfort zone when it can. The evening also featured a set of Brazilian Songs of Nature arranged by Roland Perrin. We were joined by the Blue Planet Orchestra, the Roland Perrin Trio and soprano Nina Bennet. The roar of approval from the large and appreciative audience at the end of the concert said it all. This clip is a few moments during one of the rehearsals with the band in the lead up to the concert. Following on from its 100th anniversary celebrations, the choir has commissioned several new works from both young and established living British composers. The first one was for a short piece to be sung at Christmas and this was awarded to Chris Hutchings, an award-winning, Edinburgh-based composer gaining a reputation for fine melodic compositions. Adeste Fideles is no exception and the choir really enjoyed learning and performing this new piece at its premiere during the choir's Christmas Concert. The choir is very grateful to Ronnie & Sue Dunbar for their support in the creation of this wonderful piece. To hear Adeste Fideles just click on the Soundcloud link on the right. Listen, enjoy, perform! We would love for other choirs to perform this work maybe next Christmas. It's a cracker! One of the other items in the same concert was Will Todd's delicious My Lord Has Come. You can hear that one, too, by clicking on the Soundcloud link to the left here. Apologies for the cough half way through the recording - it was live! Organist Louis Vierne (1870-1937) was one of the three French 'greats' of his time, the others being Charles-Marie Widor and Marcel Dupré. 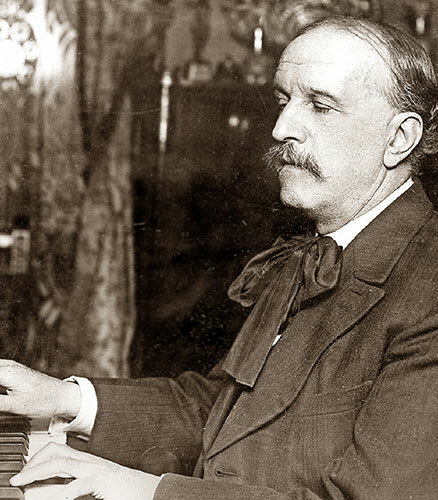 His Messe Solennelle was written for mixed choir and two organs in 1899 and at its premiere in Saint-Sulpice in Paris in 1901, Widor played the main organ, and Vierne the second, choir organ. This extract is the first movement, Kyrie, and is taken from our concert of French Gothic music in Southwark Cathedral in November 2016. Click on Vierne's image on the right to hear this. In the same programme, and in complete contrast, was Poulenc's Exultate Deo, A tricky piece, sung a cappella, it was a tough challenge for the choir to master but conquer it they did. Click on the Soundcloud image on the left to hear this. This concert was the last one in an amazingly successful anniversary season. The programme consisted of works by contemporary composers, all but one (John Tavener) still living. The content was chosen deliberately for the choir to look forward to its next 100 years but also to illustrate the fantastic strength of contemporary choral music that will carry this great and vibrant tradition on for centuries to come. One of the pieces performs was Morten Lauridsen's superb Sure on this Shining Night. Click on the Soundcloud link on the right to hear this. The concert entitled A Great British Feast contained music from three of Britain's best known composers: Vaughan Williams, Elgar and Walton. WCS was joined by members of Cardiff Polyphonic Choir and Orchestra Vitae. This clip is Let All The World In Every Corner Sing, the final movement of Vaughan Williams' Five Mystical Songs. February 2016: An interview with Music Director, Neil Ferris, and the choir's Marketing & Publicity Officer, Tilly Richardson, on local Wandsworth Radio's Artswatch programme, recorded in late February 2016. Click on the orange 'play' button in the upper left corner of the embedded Soundcloud podcast of the programme to the right. See and hear the choir in rehearsal for this concert in one of London's premier concert venues. Music Director, Neil Ferris, explains a little bit about the choir and this particular work in the clip. Further details about the concert can be found by clicking here. October 2015: The Merton Music Foundation recorded a Christmas music CD for the Doxa Deo charity, a copy of which would be included in every hamper distributed by the charity around Christmas for those in need within the Borough of Merton. Several choirs in the area participated in the recording. Wimbledon Choral Society recorded two tracks, one of which was Michael Higgins' arrangement of Tomorrow Shall Be My Dancing Day. Click on the upper Soundcloud icon to the right to hear this. The other track was the Coventry Carol. Click on the lower Soundcloud icon to the right to hear this.